SINGAPORE--(Marketwired - Oct 9, 2013) - The Singapore Marriott Hotel, which underwent a SGD 35 million refurbishment in 2012, will soon unveil a newly-refurbishment Grand Ballroom as well, bringing this iconic Hotel on Orchard Road to the next level. 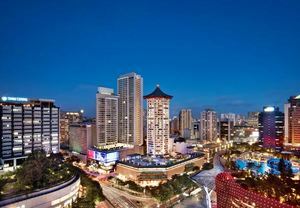 To go along with its new look, the luxury hotel in Singapore has appointed three new people to its team. "With their extensive experiences in their respective fields, they will definitely be valuable assets to our team," Antony Page, General Manager, says. Rajesh Dewan joins the Singapore Marriott Hotel as the Director of Finance, bringing more than 15 years of experience that includes work with luxury hotels in Nepal, India and Singapore. A chartered accountant from the Institute of Chartered Accountants of India, Dewan's most recent position was with the InterContinental Hotels Group. He plays a pertinent role in driving profit maximization and business growth, as well as coordinating the hotel's business plans and forecasting. The hotel, a hot spot for local dining in Singapore, also welcomes Pauline Ng as Director of Sales. Ng's start in the industry goes back to 2000, and her current role draws on her sales experience from her most recent position as assistant Director of Sales at Mandarin Oriental, Singapore. In addition to working closely with the Singapore Marriott Hotel's Director of Marketing to drive sales and revenue, Ng also trains young talent to succeed in the industry. The new additions to the hotel end on a sweet note -- literally -- with the introduction of a new Executive Pastry Chef, John Evans. His love for baking and pastry began as a young boy in Wales, where he started working for an Italian ice cream factory that had a bakery on the top floor. Today, as a professional with more than 35 years of experience, Evans creates heavenly desserts for the hotel's Singapore restaurants, including its new Java+, and loves working with chocolate and fresh berries. Singapore Marriott Hotel, best known for its iconic green pagoda roof at the corner of Scotts and Orchard roads, has completed a SGD 35 million refurbishment, bringing a new level of luxury to one of the city's best loved properties. As the most extensive project of its kind in the hotel's 18-year history, all guest rooms have been overhauled to offer guests more efficient use of space with newly installed bathrooms and ergonomically optimized furniture. Most notably, two new room categories have been introduced for the discerning business and leisure traveller: Premier Deluxe Rooms and Studio Rooms. This latest renovation, undertaken by world-renowned design team Hirsch Bedner Associates (HBA) gives the hotel a new lease on life with decor that is classic yet contemporary using neutral colours and bold accent fabrics. Rooms have been fitted with state-of-the-art furnishings including two signature 1956 leather Eames Desk Chairs. Bathrooms now come with large walk-in rain showers as well as extended vanity areas, and technology upgrades include a 46-inch Samsung Full-HD Smart TV in every room. The once traditional hotel lobby of this Orchard Road Singapore hotel has been converted into a warm and welcoming open plan zone, while Marriott Cafe boasts a sophisticated new ambience, extended seating and open kitchen block. A brand new dining concept, Java+, completes the renovation. The hotel will soon unveil its refurbished Grand Ballroom, which will offer an enhanced MICE experience -- be it for a corporate meeting, seminar, social event or wedding. The superb location and the exception service from the Event Management Team remain unchanged, making your next meeting as iconic as the luxury hotel. Visit Marriott International, Inc. (NYSE: MAR) for company information. For more information or reservations, please visit our website at www.marriott.com, and for the latest company news, visit www.marriottnewscenter.com. To match the recent hotel refurbishments at the Singapore Marriott Hotel, the hotel team also underwent an expansion. The growing property recently welcomed a new a new Director of Finance, Director of Sales, and Executive Pastry Chef.